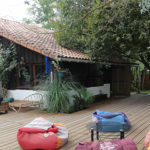 Authentic School of Surf is a reference within the surfing community and between the ocean&waves lovers. Ideal for beginners, intermediate or advanced surfers ! Either within a single group lesson or during a 5-day course, our coaches will satisfy the student’s teaching requirements, to guarantee a quick learning process. All our courses are suitable for all generations, regardless of their age (from 6 years on) and skill set: beginner, intermediate or advanced. The advanced technical courses are generally held during the week (M-F). We schedule our classes according to weather conditions and tides to guarantee quality lessons. Since on you’re on holiday we will, however, try our best to fit our schedule to yours if you have any specific requests. -We provide the necessary gear for the lesson (soft board and wetsuit, either steamers or spring suits). -Groups are composed of maximum 8 students, and are organised on the basis of age, surfing skills, family&friends and trying to best satisfy your goals. -The coaching technique will vary according to each student’s skill set and desired achievements. -All our coaches are official surf instructors of the French National Surf Federation and detain a lifeguard and first-aid certificate. We provide the necessary gear for the lesson (soft board and wetsuit, either steamers or spring suits). Groups are composed of maximum 8 students, and are organised on the basis of age, surfing skills, family&friends, trying to best satisfy your needs and goals. The coaching technique will vary according to each student’s skill set and desired achievements. All our coaches are official surf instructors of the French National Surf Federation and detain a lifeguard and first-aid certificate. -The school’s license issued by the « Fédération Française de Surf » covers every student in a lesson with a third-party liability insurance. -If weather conditions are considered not appropriate or dangerous by the coach, for the safety of the students (e.g. thunderstorms), the class will be re-scheduled or re-reimbursed. 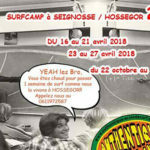 -The lessons and courses are given in and around Seignosse, Hossegor and Capbreton all-year round; during summer, from June till September, you can find us on the left of ‘The Casernes Beach’ when facing the sea.